Arcadia, CA (March 24, 2018)-Selcourt keeps carrying her speed forward on the Southern California circuit. 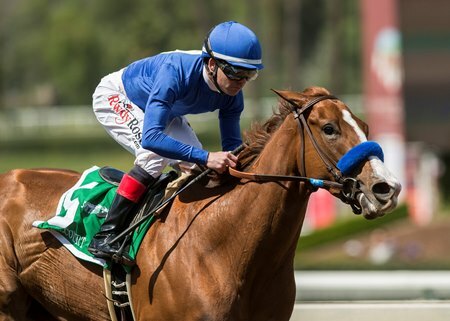 In the $200,000 Santa Monica Stakes (G2) March 24 at Santa Anita Park, Medallion Racing, Keith Abrahams, and Sandra Lazaruk’s quick Tiz Wonderful filly recorded her longest victory yet, winning the seven-furlong test in a blazing 1:21 flat. Aided by a slow break from potential early challengers Paradise Woods (a dual grade 1 winner) and Marley’s Freedom, Selcourt shot to an easy lead and set fractions of :22.85 and :45.13 through a half-mile. Paradise Woods got up into contention soon enough after her poor break and stalked the pacesetter about a length behind through much of the backstretch, but her challenge in the turn was short-lived. Selcourt shrugged off her rival when Paradise Woods attempted to move alongside in the bend and kicked away from the field in the stretch to win by 4 1/2 lengths. Paradise Woods, the 4-5 favorite and last year’s Santa Anita Oaks (G1) and Zenyatta Stakes (G1) winner, tired late and finished fourth. Marley’s Freedom came in second, and Skye Diamonds finished third. Selcourt, who won her debut in February of 2017 and placed in two stakes before she got an eight-month layoff, is now undefeated in three 2018 starts. She kicked off her 4-year-old campaign with a 7 1/2-length victory in the 6 1/2-furlong Kalookan Queen Stakes and earned her first graded win in the six-furlong Las Flores (G3) Feb. 18. Sadler said after the race Selcourt could continue to rise up the class ladder and try a grade 1 next time out. Born and raised for breeder Abrahams at Columbiana Farm Paris, Kentucky she is out of the Open Forum mare Azure Spring, Selcourt has a 4-1-1 record with $283,920 in earnings.